I really wanted to win the seat on the Los Angeles College District Board of Trustees. The more experiences I had in the campaign the more I became invested in this. I fantasized about what I would do with the other Board members were I to be elected. There were several tangible rewards to be gained from being a candidate. I became very focused, purposeful and energized from the campaign. New friendships developed and I learned a great deal---about the District and about how it functions (and not so….). I thoroughly enjoyed the campaigning: the forums, the questions, the challenges, the personal interactions---the chance to be involved with something that really mattered. And I got to support the staged reading of a wonderful play by Edmund White. What I make of all this are several important lessons. Running for the right political office is very worthwhile. It makes us put our heart and our talents where our critical mind often takes center stage. It affords us a chance to be involved, to contribute, and to try to make a difference. It gives us a chance to believe in ourselves (or not….). Running for office also takes money (lots of it), talented associates who are often volunteers, energy and stamina and a thick-skinned perspective every day. It takes planning and focus and insight. It requires us to rise above some of our personal selves. Many voters----and almost all vested interests (I am thinking here of the Democratic parties and the teachers unions and even the Los Angeles Times) are going to support the status quo. They are going to be cautious and conservative in their approaches. You have to work hard to gain their support---or even to get their attention. Campaigning is often an uphill exercise. But, at the end of the day, I am very glad I made the considered decision to run and to be involved. The rewards and learning will be a treasure for the rest of my life. I found new ways to be connected and I want to stay connected. Finally, campaigns bring unexpected support and openness and favors. I treasure the mew friendships I made and am grateful for all the encouragement, participation, contributions and support I received. Many of my friends either volunteered many hours and much talent or were sources of encouragement and strength. Again, this all will have a very long shelf life. So, if you are reading this, please know that I valued your support. And I had a wonderful, rich time. A voicemail had been left for me. The caller said she is a Latina who had come across my name and wanted to ask me a simple question. Depending on my answer she said she might vote for me. Hurriedly I returned her call. The woman who answered sounded fairly young and was very polite. After some obligatory small talk she explained that her question was simple and would not take much time. She then thanked me for my answer and for getting back to her quickly. She hung up. Well, I thought, that must be an organized campaign---Baptists perhaps. Wow, I thought. You cannot prejudge anyone’s stance or sensibilities. To do so would be to risk misjudging—or as critical, to miss the chance to learn from another person. I saw this small incident as a reminder to be both honest and a good listener in the campaign. I relished the diversity I would encounter and vowed to do my best to rise to meet the challenge and opportunity. March 3, 2015 is Election Day - Why you should Vote for Steve Schulte? It's important to cultivate your talents and pursue your passions. The education system was the inspiration to create a landscape to foster personal development, intellectual growth and happiness. Knowledge, resources and time are necessary components to create greats minds and a brighter future for generations to come. March 3, 2015 is Election Day. The foundation for a successful democracy sits on three legs to a "table" (our Enlightened Constitution of the United States of America). Our legal system is designed for the people, by the people, from the people. If one leg is missing the "table" will fall. "Repair" will cost more tax payer money than wisely maintaining and building upon the success that has already been developed. It's time to take action to be as resourceful and diligent to improve the education system and the whole LACCD. There are 9 colleges in the district and it will be my pleasure and purpose to improve the landscape of the district. I will invest to support and develop more student programs. I will hire more professors, teachers and teacher's aides (increase employment opportunities and rates). There will be more availability, more educational programs, and a more structured curriculum. Our college district will prepare you (students) to find work, cultivate you for a successful career, and increase your general understanding on many specific subjects. Every vote counts. 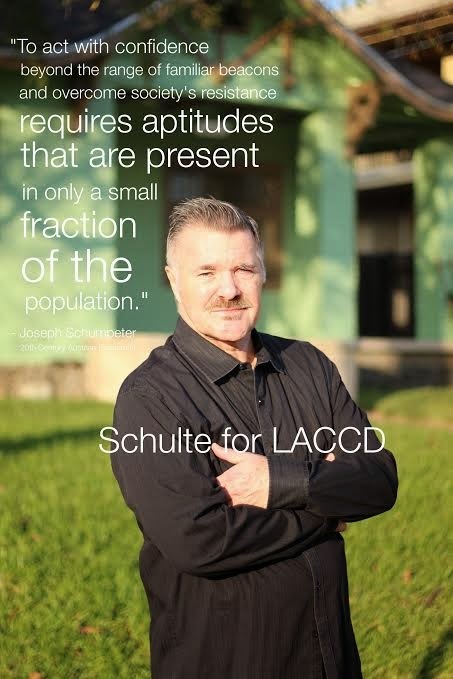 This Wednesday Vote Schulte to help improve the Los Angeles community college District. Last Friday at the request of a writer for the college newspaper (“The Roundup”) I spent several hours on the campus of Pierce College in Woodland Hills. Pierce is one of the nine community colleges in the LACCD system. It has a long and proud history in Los Angeles. Most of the time that day was spent in touring the Farm Center , which, along with the larger farm, comprises nearly 250 acres of land granted to Pierce College in the earlier days of the college. The entire parcel is green and lush. It provides land for crops, for a variety of farm animals, for “eco-agriculture” programs and for the efforts of several hundred students who major in large animal science, equine studies, pre-veterinary programs and other pursuits at the college. Yet the Farm Center is threatened by discussion (and threats) of plans for adding to the encroaching development nearby----the condoization of Woodland Hills. Moving in this direction would reduce options for study at Pierce, would reduce avenues of farm income and would destroy a large and very significant open space at the edge of the college. Open space that is badly needed in sprawling Los Angeles. Development would greatly diminish what is distinctive----and for many students----attractive about Pierce. Yet all this fits a pattern. It is a pattern of poor management and short-sighted decisions that affect not just Pierce but all of the nine colleges. It is a pattern that keeps the colleges far short of reaching their promise, of delivering on what they were intended to deliver. Driving around the rest of the Pierce campus one sees fine buildings, athletic fields, charming faculty office buildings, newer facilities-----all of which would seem to contribute to a good college experience. The fact that Pierce and the other colleges fall short of this promise is tragic----and a failure to deliver as promised. When I went to college I was fortunate enough to receive a four-year scholarship to one of the finest colleges in the country. My four years at Yale were rich and rewarding and life-changing. The experience is what I would hope that college would be for all students who the desire, are willing to work hard and who dream of achieving. That is why the motto for my campaign is “the college education you deserve”. I hope you will agree and that together we can work hard over the next several years to make our nine community colleges truly worth our pride and involvement. El viernes pasado, a petición de un escritor para el periódico de la universidad ("El Roundup") me pasé varias horas en el campus de Pierce College en Woodland Hills. Pierce es uno de los nueve colegios de la comunidad en el sistema LACCD. Tiene una larga y orgullosa historia en Los Angeles. La mayoría de las veces ese día se gastaron de un recorrido por el Centro de la granja, que, junto con la granja más grande, cuenta con cerca de 250 acres de tierra otorgados a Pierce College, en los primeros días de la universidad. Toda la parcela es de color verde y exuberante. Proporciona tierras para cultivos, para una variedad de animales de granja, para los programas de "eco-agricultura" y por los esfuerzos de varios cientos de estudiantes que se especializan en la ciencia animal de gran tamaño, los estudios de equino, programas pre-veterinaria y otras actividades en el colegio. Sin embargo, el centro de la granja se encuentra amenazada por la discusión (y amenazas) de los planes para añadir a la elaboración invadiendo cerca ---- la condoization de Woodland Hills. Moverse en esta dirección sería reducir las opciones para estudiar en Pierce, reduciría avenidas de ingresos agrícolas y destruiría un espacio abierto grande y muy significativa en el borde de la universidad. El espacio abierto que se necesita con urgencia en expansión de Los Ángeles. Desarrollo disminuiría en gran medida lo que es distintivo ---- y para muchos estudiantes ---- atractivas sobre Pierce. Sin embargo, todo esto encaja en un patrón. Es un patrón de decisiones de gestión y miope pobres que afectan no sólo Pierce pero todos los nueve colegios. Es un patrón que se mantiene a los colegios muy lejos de llegar a su promesa, de la entrega de lo que estaban destinados a entregar. Conducir por el resto del campus Pierce se ve hermosos edificios, campos deportivos, encantadores edificios de oficinas profesores, nuevas instalaciones ----- todas las cuales parecerían contribuir a una buena experiencia universitaria. El hecho de que Pierce y los otros colegios están a la altura de esta promesa es trágico ---- y una falta de entrega según lo prometido. Cuando fui a la universidad tuve la suerte de recibir una beca de cuatro años para una de las mejores universidades del país. Mis cuatro años en Yale eran ricos y gratificante y que cambia la vida. La experiencia es lo que yo espero que la universidad sería para todos los estudiantes que el deseo, están dispuestos a trabajar duro y que sueñan con alcanzar. Por eso el lema de mi campaña es "la educación universitaria que se merece". Espero que estén de acuerdo y que juntos podemos trabajar duro en los próximos años para que nuestros nueve colegios de la comunidad realmente vale la pena nuestro orgullo y la participación. Pichalē śukravāra kō kŏlēja samācāra patra (" rā'uṇḍa'apa") kē li'ē ēka lēkhaka kē anurōdha para maiṁ vuḍalaiṇḍa hilsa mēṁ piyarsa kŏlēja kē parisara mēṁ ka'ī ghaṇṭē bitā'ē. Piyarsa LACCD praṇālī mēṁ nau sāmudāyika kŏlējōṁ mēṁ sē ēka hai. Yaha lŏsa ēn̄jilsa mēṁ ēka lambī aura garva itihāsa rahā hai. Samaya sē adhikānśa usa dina baṛā khēta kē sātha sātha, kŏlēja kē pahalē kē dinōṁ mēṁ piyarsa kŏlēja kē li'ē dī ga'ī jamīna kī lagabhaga 250 ēkaṛa jamīna śāmila hai, jō phārma kēndra, paryaṭana mēṁ kharca kiyā gayā thā. Pūrē pārsala harē aura rasīlā hai. Yaha" paryāvaraṇa kē kr̥ṣi" kāryakrama kē li'ē aura ka'ī sau chātrōṁ kē prayāsōṁ kē li'ē, khēta jānavarōṁ kī ēka kisma kē li'ē, phasalōṁ kē li'ē bhūmi pradāna karatā hai, jō baṛē paśu vijñāna, ghōṛē kā adhyayana, pūrva paśu cikitsā kāryakramōṁ aura kŏlēja mēṁ an'ya gatividhiyōṁ mēṁ pramukha hai. Abhī taka phārma kēndra ---- pāsa kē atikramaṇa kē vikāsa kē li'ē vuḍalaiṇḍa hilsa kē condoization jōṛanē kē li'ē yōjanā'ōṁ kī carcā (aura dhamakiyōṁ) nē dhamakī dī hai. Isa diśā mēṁ āgē baṛha kr̥ṣi āya kē rāstē kō kama karēgā, piyarsa para adhyayana kē li'ē vikalpōṁ kō kama karēgā aura kŏlēja kē kinārē para ēka baṛē aura bahuta hī mahatvapūrṇa khulī jagaha kō naṣṭa karēgā. Burī taraha sē lŏsa ēn̄jilsa viśāla mēṁ kī jarūrata hai ki khulī jagaha. Vikāsa bahuta viśiṣṭa hai kyā kama ---- aura piyarsa kē bārē mēṁ ākarṣaka ka'ī chātrōṁ ---- kē li'ē hōgā. Phira bhī yaha saba ēka paiṭarna phiṭa baiṭhatā hai. Yaha piyarsa lēkina nau kŏlējōṁ kē sabhī na sirpha prabhāvita karanē vālē garība prabandhana aura adūradarśī nirṇayōṁ kī ēka pad'dhati hai. Yaha vē vitarita karanē kē irādē sē kī ga'ī hai para pahun̄cānē kī, apanē vādē taka pahum̐canē kī aba taka kama kŏlējōṁ rahatā hai ki ēka paiṭarna hai. Piyarsa parisara mēṁ ēka kē bākī cārōṁ ōra ḍrā'iviṅga ṭhīka bhavanōṁ, ēthalēṭika kṣētrōṁ, ākarṣaka saṅkāya kāryālaya bhavanōṁ, ēka acchē kŏlēja anubhava karanē kē li'ē yōgadāna karanē kē li'ē pratīta hōtā hai ----- jō sabhī kē na'ē suvidhā'ēṁ dēkhatā hai. Piyarsa aura an'ya kŏlējōṁ isa vādē kī kamī tathya yaha hai ki dukhada hai ---- aura vādā kiyā thā kē rūpa mēṁ ēka viphalatā dēnē kē li'ē. Maiṁ kŏlēja kē pāsa gayā jaba maiṁ dēśa mēṁ bēhatarīna kŏlējōṁ mēṁ sē ēka kē li'ē ēka cāra sāla kī chātravr̥tti prāpta karanē kē li'ē kāphī bhāgyaśālī thā. Yēla mēṁ mērē cāra sāla kē li'ē amīra aura puraskr̥ta aura jīvana badala rahē thē. Anubhava maiṁ kŏlēja icchā, kaṛī mēhanata karanē kē li'ē taiyāra kara rahē haiṁ aura prāpta karanē kā jō sapanā jō sabhī chātrōṁ kē li'ē hōgā um'mīda karēṅgē ki kyā hai. Apanē abhiyāna kē li'ē ādarśa vākya" tumhārē lāyaka kŏlēja kī śikṣā" yahī kāraṇa hai ki hai. Maiṁ āpa sahamata hōṅgē aura āśā hai ki hai ki hama ēka sātha hamārē garva aura bhāgīdārī hamārē nau sāmudāyika kŏlējōṁ sacamuca kē lāyaka banānē kē li'ē agalē ka'ī varṣōṁ mēṁ kaṭhina kāma kara sakatē haiṁ. Thứ sáu tuần trước theo yêu cầu của một nhà văn cho các tờ báo đại học ("The Roundup") Tôi đã dành nhiều giờ trong khuôn viên của Pierce College ở Woodland Hills. Pierce là một trong những trường cao đẳng cộng đồng trong hệ thống LACCD chín. Nó có một lịch sử lâu dài và đáng tự hào trong Los Angeles. Hầu hết thời gian trong ngày hôm đó đã được chi tiêu trong chuyến lưu diễn của Trung tâm Nông, trong đó, cùng với các trang trại lớn hơn, bao gồm gần 250 mẫu đất được cấp cho Pierce College trong những ngày trước đó của các trường đại học. Toàn bộ bưu kiện là màu xanh lá cây và xanh tốt. Nó cung cấp đất cho cây trồng đối với một loạt các động vật trang trại, cho "nông nghiệp sinh thái" và các chương trình dành cho những nỗ lực của hàng trăm sinh viên người lớn trong khoa học lớn động vật, nghiên cứu các chú ngựa, các chương trình pre-thú y và hoạt động khác tại trường. Tuy nhiên, Trung tâm Nông đang bị đe dọa bởi cuộc thảo luận (và các mối đe dọa) các kế hoạch để thêm vào sự phát triển lấn lân cận ---- các condoization của Woodland Hills. Di chuyển theo hướng này sẽ làm giảm các lựa chọn để nghiên cứu tại Pierce, sẽ làm giảm đường thu nhập trang trại và sẽ phá hủy một không gian mở rộng lớn và rất quan trọng ở rìa của các trường đại học. Không gian mở là rất cần trong sắc màu rực rỡ Los Angeles. Phát triển rất nhiều sẽ làm giảm bớt những gì là đặc biệt ---- và cho nhiều sinh viên ---- hấp dẫn về Pierce. Tuy nhiên, tất cả điều này phù hợp với một mô hình. Đây là một mô hình của các quyết định quản lý và thiển cận nghèo ảnh hưởng đến không chỉ Pierce nhưng tất cả các trường cao đẳng chín. Đây là một mô hình mà giữ các trường cao đẳng xa ngắn đến lời hứa của họ, của việc cung cấp về những gì họ đã dự định để cung cấp. Lái xe quanh các phần còn lại của khuôn viên một Pierce thấy các tòa nhà tốt, lĩnh vực thể thao, các tòa nhà văn phòng khoa quyến rũ, cơ sở vật chất mới ----- tất cả trong số đó sẽ có vẻ để đóng góp cho một kinh nghiệm học tốt. Thực tế là Pierce và các trường cao đẳng khác rơi ngắn của lời hứa này là bi kịch ---- và một thất bại để cung cấp như đã hứa. Khi tôi đi học đại học, tôi đã may mắn nhận được một học bổng bốn năm để một trong những trường đại học tốt nhất ở đất nước này. Bốn năm của tôi ở Đại học Yale là phong phú và bổ ích và thay đổi cuộc sống. Kinh nghiệm là những gì tôi hy vọng rằng đại học sẽ được cho tất cả các sinh viên mong muốn, sẵn sàng làm việc chăm chỉ và người mơ ước đạt được. Đó là lý do tại sao phương châm cho chiến dịch của tôi là "giáo dục đại học, bạn xứng đáng". Tôi hy vọng bạn sẽ đồng ý và cùng nhau chúng ta có thể làm việc chăm chỉ trong vòng vài năm tới để làm chín các trường cao đẳng cộng đồng của chúng tôi thực sự giá trị niềm tự hào và sự tham gia của chúng tôi. "To act with confidence beyond the range of familiar beacons and overcome society's resistance requires aptitudes that are present in only a small fraction of the population."